Sangria is the all time budget-friendly boozy beverage. Because you can get away with using the cheapest ingredients, most of which are probably already in your fridge or freezer, and everything will turn out fine. In spite of all this, restaurants charge between 10 and 20 bucks for a pitcher of what was probably made with leftovers. Below I have a recipe for a pitcher of sangria. Try making some at home! It's easier than you think and will please a crowd in a pinch. Unless they read this blog, I guarantee your guests will never know how cheap it is to make, and probably won't care when they realise how good it is. 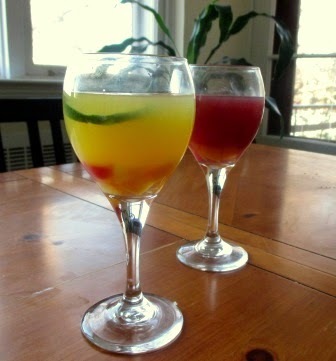 2 Cups of Red - OR - White Wine - For red sangria, use the red wine, for white sangria use the white wine, the other ingredients will pair well regardless of what type you use. Have some leftover wine from a party? This is a great time to use it. 4 Cups of Fruit Juice - You can use the cheapest, safely drinkable juice you can find, but if you're making white sangria, stay away from reddish juices like cranberry or grape as it will tint the sangria, thus defeating the purpose of making it white. 1 Cup of Fruit - coarsely chopped - Have a can or jar of fruit cocktail you never use? Extras or leftovers from a fruit platter? Leftover fruit salad? Throw it into the sangria. 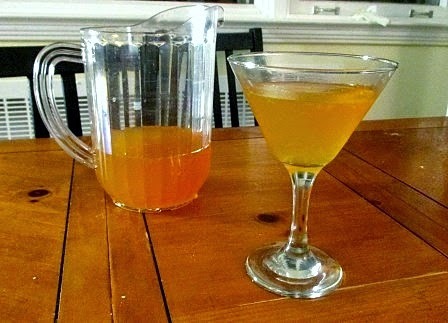 Some leftover liquor - Optional - Sometimes you find yourself with a bottle containing a few tablespoons of vodka, rum, or some fancy liqueur from a party that - while totally drinkable - isn't worth pouring into a glass or adding to a cocktail shaker. You can throw it into the sangria. Throw all the ingredients into a pitcher and stir to combine. If you're using the mint leaves, be sure to mash them a bit with the wooden spoon to release the oils. Next time I'll be teaching you MY cure for hangovers. Are you a beer lover tired of drinking it alone because your friends or relatives are put off by its taste? Shandy just might be the solution. A shandy is a beer cocktail consisting of beer mixed with a non alcoholic beverage. Like training wheels on a bicycle, it's a good way to win people over to beer drinking because the non alcoholic ingredient mutes the bitterness of the beer. Plus it's budget friendly. Once they get used to drinking shandy, you can slowly increase the ratio of beer in the recipe until the "training wheels" can come off and they can drink beer without gagging. For my shandy recipe, I opted to use blonde beer, as I find the taste just subtle enough not to put my drinkers off, and yet prominent enough for them to know they are actually drinking beer. 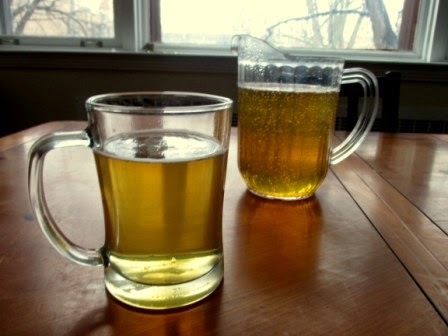 Pour the beer into the pitcher and add the non alcoholic ingredient of your choice. Next week, I'll show you two versions of that party favorite: Sangria! When I reached legal drinking age, my parents insisted I throw a party. They told me to invite everyone I knew, and that they would even provide the booze. The night of the party, a dozen or so of my friends were just settling in to my parents' dining room when my mother brought in a large bowl of red liquid. 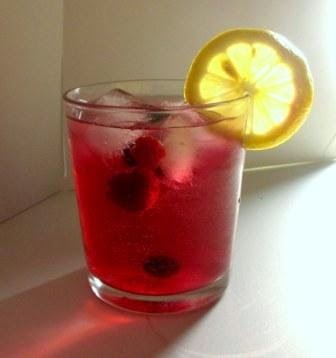 It had lemon slices and berries floating in it, and fizzed pleasantly on the tongue. One taste, and - despite the fact that it seemed to be alcohol free - it was deemed delicious and the bowl was emptied in a matter of minutes. "You know I put rum in there, right?" My mouth dropped open, and thrusting the bowl at her, I ran to see how my guests were faring. Not surprisingly, one or two people had already passed out. Needless to say: it's my mother who taught me how to mix drinks, and to this day, I swear by her punch recipe to oil my guests in a pinch. 2 or 3 Cups of Rum - use the cheapest, but safely drinkable rum you can find. I used Bacardi Superior white rum, but anything will do. 1 Can of Frozen Concentrated Fruit Punch - any punch will do. 6 Cups of Ginger Ale - Once again, the brand doesn't matter. 1 Large Bowl or Pitcher - A heavy salad bowl will do the job, as will a mixing bowl, or you can get a pitcher at the dollar store. 1 Knife and Cutting Board - if adding the lemon. Pour the rum into your bowl or pitcher. In the same bowl or pitcher, prep the frozen punch according to the instructions on the can. Add the berries and lemon slices, if using. Stir the whole thing with a wooden spoon and serve as is or over ice! Next week, I'll show you how to win over beer haters with that pub classic: shandy! The holidays are a-coming and a lot of us will be entertaining friends and family. The cost of entertaining is high, partly because we have to spend all day before the party cleaning our homes so our friends and relatives don't think we're pigs, but also because feeding and getting your guests drunk can get pretty expensive. While you can get a bottle of wine for as little as ten bucks, cocktail ingredients such as hard liquor, fruit, and juice, are all pretty costly. In the next few entries, I'll be showing you ways to get your guests drunk on a budget. The secret is to keep things sweet. For some strange reason, sugar enhances the effect of alcohol on our systems. I have no idea why that is, and couldn't find a study on the subject anywhere. All I know is that the sweeter the drink, the drunker you get on a smaller amount. That means that you can get away with using very little costly liquor if you make the drink sweet enough. All that said, let's get boozing! If you order an amaretto sour in a bar or club, it will probably run you between 5 and 8 bucks plus tip. That's a whopping 10 dollars for a drink you can make easily and cheaply - in bulk, no less - at home! It takes all of 3 minutes to prepare, will easily oil a crowd of 4, and tastes just like anything you'd get in a bar or club for a fraction of the price. When making this, be sure to use the cheapest - but safely drinkable - amaretto you can find. You also need to warn any guests with nut allergies, as the base for this cocktail is almond liqueur. Total Prep Time: Approximately 3 minutes. 2 Cups of Amaretto - this is a sweet almond liqueur that's about 24% proof. You can find it in any liquor store, and with holidays coming, you can probably get it on sale. Be sure to buy the cheapest amaretto you can find, as its flavor won't matter too much as long as it's relatively almond-ey. Measure out 2 cups of Amaretto and put it in the pitcher. In the same pitcher, prep the frozen lemonade according to the instructions on the can (dump in the frozen concentrate + using the can that used to contain the concentrate, add 3 to 4 cans of water). Stir it with a wooden spoon to combine and you're good to go! Stay tuned for next week when I'll be showing you how to make my mother's famous rum punch! 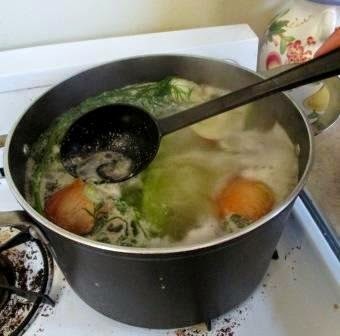 Soup cookery all too often gets a bum rap for being tedious and time consuming. 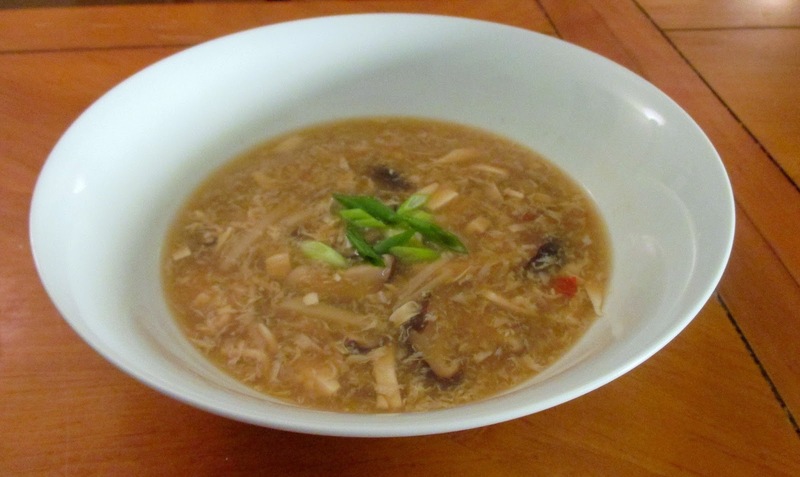 Hot and Sour Soup is the exception to that rule, taking as little as 30 minutes to prepare. An Asian cross between egg drop and mushroom soup, it's hearty, filling and delicious. I learned to make it in college when I had a craving for Hot and Sour and didn't feel like going to a Chinese restaurant to get it. For all you meat lovers and/or tofu haters, don't be put off by the tofu, the other stuff in this soup gives it plenty of flavour while still maintaining its silky texture. 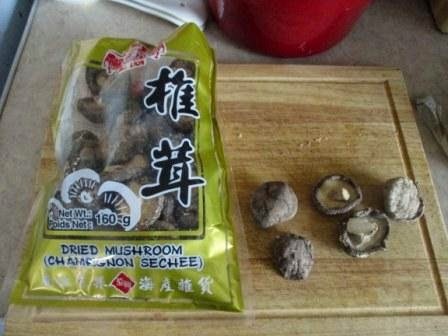 7 Dried Shiitake Mushrooms - These can be found in any Asian market labelled simply as "Dried Mushrooms". See the image below. Though you won't need the whole bag, these will keep for a long time and can be rehydrated as needed for use in soups and stir fries. Can't find em'? No problem! Use another type of dried mushroom instead. They're available in most major grocery stores. 1/2 Cup of Soft Tofu - sliced into thin strips. Made from soybeans, Tofu is an extremely versatile ingredient as it can be used in savory things like soups or stir fries, and sweet ones like smoothies and non dairy ice cream. It's usually found in the produce section of the grocery store among the organic salad dressings and vegetarian meat alternatives. If you like tofu and have access to an Asian market, buy it from there, as you can get a large tub of the stuff for about 2 bucks. 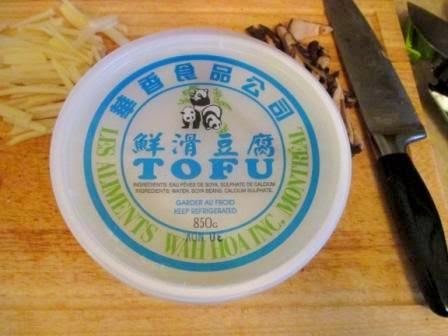 1/4 Cup of Sliced or Shredded Bamboo Shoots - OPTIONAL - Great in soups, salads, and stir fries, you can find these in a can already shredded or sliced in most Asian markets and in the Asian foods section of some major grocery stores. See the image below so you know what to look for. If the pieces are too big for your taste, you can always cut 'em thinner as I did. While they do add great texture and crunch to this soup, they're not necessary. 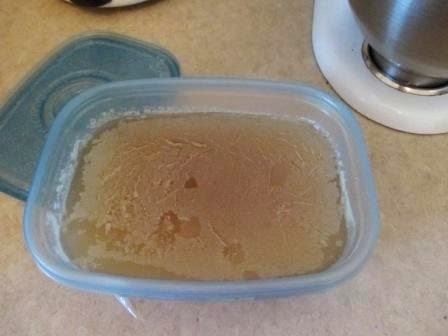 6 Tablespoons of Vinegar - I used Apple Cider Vinegar in this recipe, but you could also use Plain White or Rice vinegar instead. This puts the "sour" in Hot and Sour Soup. Try to stay away from wine and flavored vinegars, as the taste will overpower the soup. 1/8 of a Teaspoon aka a drop of Sesame Oil - a little of this stuff goes a VERY long way. If you don't like and/or can't have spicy food, leave it out. Salt - to taste - If you're salt sensitive, go easy, as soy sauce has plenty. 1 Green Onion aka Scallion - Cleaned and thinly sliced - this is the only topping your soup will need, and adds a nice oniony brightness and colour. In the first regular bowl, pour hot water over the dried mushrooms and cover with a plate, foil, or plastic wrap. Leave them for at least 15 minutes or until soft and sliceable. While the mushrooms are rehydrating, get your other ingredients together. In another regular bowl, beat your egg. In your third regular bowl, mix your cornstarch and water. Using your trusty knife and cutting board, slice up your tofu. 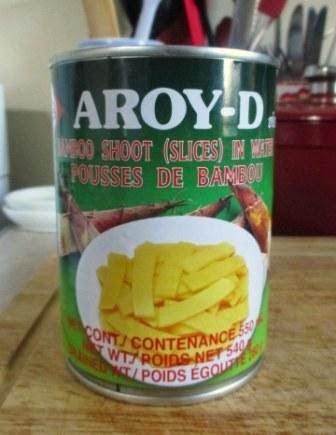 Open your can of Bamboo Shoots (if using) and measure out the amount you need. With a sharp knife, cut a 1/4 inch off the end of your green onion, give it a quick rinse, dry it with a clean paper or tea towel, and then thinly slice and set aside. After 15 minutes, take the mushrooms out of the hot water. If using the dried shiitake mushrooms, carefully remove and discard the stems. They're tough and inedible. Using your knife and cutting board, slice the mushrooms into thin strips. You are now ready to get cooking. In a medium pot on medium-high heat, add the vinegar, soy sauce, chili or hot sauce, and sesame oil. 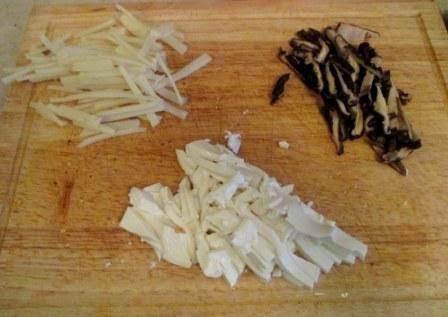 Give it a stir and add the mushrooms, tofu, and bamboo shoots. Bring to a boil and stir in your beaten egg, mixing constantly for 1 or 2 minutes in order to fully cook the egg. 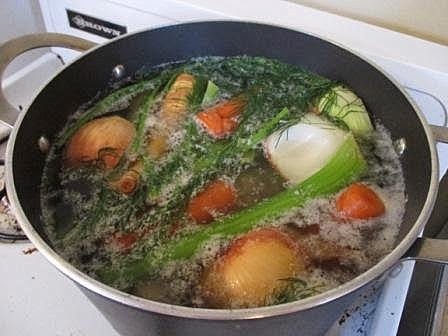 Now add your cornstarch and water mixture and stir well so it doesn't form lumps in your soup. Simmer the soup, uncovered for 1 more minute and give it a taste, adding salt and pepper if you think it's not Hot and Sour enough. Ladle it into bowls and top with the sliced green onion. You've made Hot and Sour Soup! Next week I'll be teaching you that all time comfort classic : Chicken Soup! If you live in one of the chillier parts of North America as I do, you know that we have a long and nasty winter ahead. We're talking blizzards, ice, sub zero temperatures, and an entire population of disgruntled people cursing Mother Nature. There are many ways to fight the cold: layered clothing, thick down coats, hot beverages, and foods that warm us both inside and out. It is on that note that I present you with this series on soups. 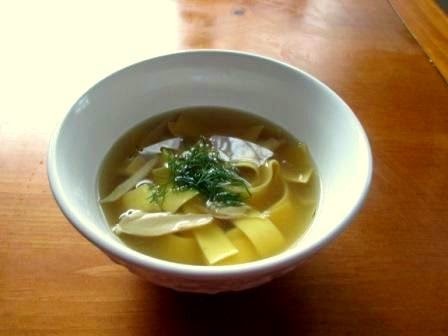 I learned to make soups not from my mother, but because she, despite being an AMAZING cook, has yet to master soups (with one exception: her chicken soup is wonderful!). Most of my mother's soups are fit to insulate the walls rather than one's stomach. After eating one too many of her "experiments", I made it my culinary mission to master at least 3 soups. On this mission, I learned to make Chinese Hot and Sour Soup, my mother's Chicken Soup, and Butternut Squash and Curry. Once I got the principles of soup making down, I was able to expand my repertoire and am constantly doing so. Should you choose to accept it, of course. In this and the next 2 entries, you'll find 3 recipes to get you started. 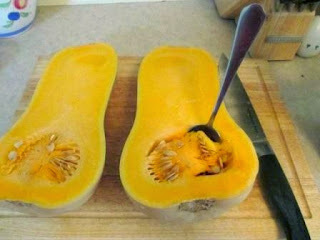 I have to confess that before I discovered that you could make squash into a soup, I didn't like it. I found it too sweet, too starchy, and reminiscent of baby food when mashed or pureed. And then I started playing with spices and seasonings and discovered that squash can be lovely if flavored correctly and presented in a smooth soup. It is with this discovery that I developed this one. It's ridiculously easy to make, and the cilantro lime cream, while not necessary, makes it extra special by adding a refreshing citrusy richness. 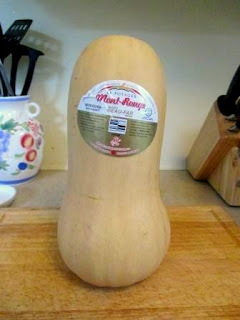 1 Large Butternut Squash - about 4.5 pounds - most grocery stores will have a scale that you can weigh it in. I chose Butternut Squash because they're currently in season and easily recognizable. Just in case don't know what to look for, here's a picture. 1 Tablespoon of Grated Fresh or Frozen Ginger Root - Ginger root can now be found in almost any grocery store that carries fresh fruits and vegetables. 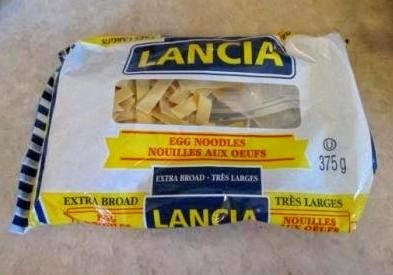 It's usually kept near the onions and garlic. Peeled and sliced, it can be added to stir fries and curries, and grated, to marinades, salad dressings, soups, and even teas. 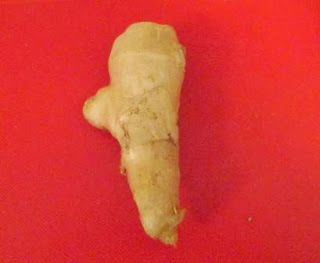 Ginger root is great for the stomach, and keeps for a few weeks in the fridge. I keep mine in the freezer where it will stay fresh even longer and once frozen, will be even easier to grate. Don't know what to look for? Here's a picture of a small piece. Carefully slice the squash down the middle and scoop out the seeds and thready bits in the hollow on the inside of the base. See the images below. You can now CAREFULLY - as raw squash is quite tough - peel the tough outer skin off the squash with a peeler or with a (small) paring knife. Cut the peeled squash into chunks and dump them in your pot. 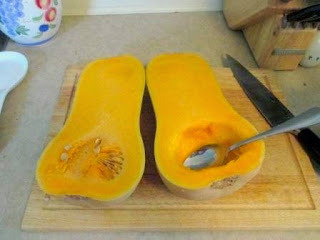 Add about 6 cups of water or just enough to make the squash float a bit. Put the pot on the stove and bring the contents to a boil. Lower the heat, cover the pot, positioning the lid so a little steam is escaping, and simmer for about 20 minutes or until the squash is tender. You can test for tenderness by pulling a chunk out of the pot with a slotted spoon, putting it on a plate or cutting board and trying to mash it with a fork or your potato masher. See the image below. 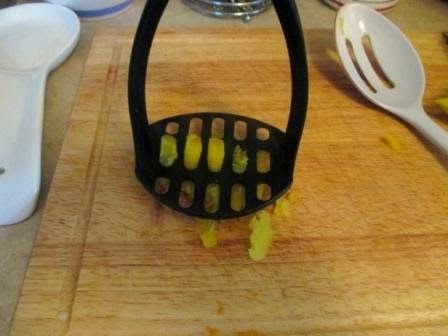 If it mashes easily, the squash is ready. If it doesn't... and/or goes flying across the room... it probably needs more time. Turn off the heat and let the contents cool for at least 10 minutes. You can now squash your squash in the water using your trusty potato masher OR if you like your soup extra smooth, use an immersion blender. If you opt to use the blender, BE CAREFUL! Hot liquid and puree tends to splatter a bit during blending, so be sure to wear an apron or old T-shirt and use your free hand to use the pot lid as a shield when doing this. Add the Curry Powder, put the pot back on the heat, and boil for another 10 minutes or so to bring out the flavor of the curry. Remove from the heat and stir in the Ginger. Season it with Salt and Pepper to your taste and serve as is or with the Lime Cilantro Cream. To make the cream, rinse a handful of fresh cilantro (leaves and stems but not the roots) to get the dirt off and then either dry it with paper towel or shake it vigorously. For added fun, you can do this to music, or shake the water onto an unsuspecting loved one. 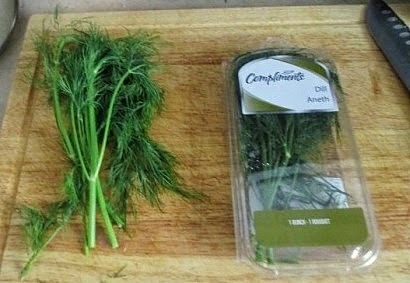 Chop the cilantro as finely as you can and put it in a bowl or plastic container. Add the yogurt or sour cream, lime zest (outer skin of the lime grated right off the lime using your trusty box grater), and mix well. Give it a taste. If it's tart enough for you, you're ready to go! If not, season it with a little salt. You could also make this cream in the food processor if you have one, but the food processor will most likely make the cream runnier as processing the fresh cilantro will bring out more of the water in it. 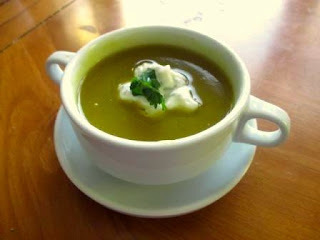 To serve your soup with the Cilantro Cream, scoop some hot soup into a bowl and put a healthy spoonful of the cilantro cream in the center. To make it look extra fancy, you can top it with a little more fresh chopped cilantro. Serves 6 people or 1 person for at least a week if kept in the fridge, depending on appetite. Next time I'll be teaching you my personal favorite: Chinese Hot and Sour Soup!